Hillbsborough 1989. The worst sporting disaster in British history. Who can forget those pictures of fans being crushed to death? The feeling of helplessness. The shock of the onlookers who were witnessing the lives being lost. The discussions of who was to blame. The fear of family and friends of the supporters all over the country. The shivers felt when You'll Never Walk Alone was played. 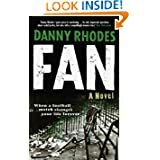 Fan is a work of fiction, based around the tragedy of Hillsborough. The author, Danny Rhodes, was actually there on that day and has used his experience and emotion to write an intense and detailed account of how the event could have impacted someone who witnessed it all. Danny Rhodes has bared his soul with this book. Raw, intense and profound, it is a book that will stay with you long after you have turned the final page. You don't have to know anything about football to understand the meaning of this book. You just need to understand grief, trauma and reality.